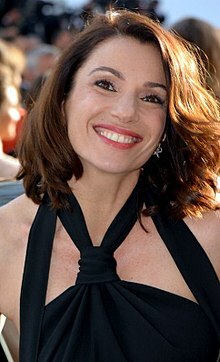 Aure Atika (born 12 July 1970) is a French actress, writer and director. Born to Jewish-Moroccan Ode Atika Bitton and Frenchman Michel Fournier, his father was born in Algeria from the Aimeur family of film actors and directors, Atika grew up in Paris. She won the 2004 Best French-Language Short Film Award at the Créteil International Women's Film Festival for À quoi ça sert de voter écolo? (What's the Point of Voting Green?) (2003) and was nominated for the 2010 César Award for Best Supporting Actress for Mademoiselle Chambon (2009). Atika has one daughter, Angelica (February 2002), with Philippe Zdar of house music group, Cassius. 2003 À quoi ça sert de voter écolo? Writer/Director Short, title transl., "What's the point of voting Green?" 2007 De l'amour Director Short, title transl., "In Love"
2013 On ne badine pas avec Rosette Director Short, title transl., "You do not mess with Rosette"
award, 2004 Prix de la Fondation Beaumarchais, best short film, for À quoi ça sert de voter écolo? (2003). nomination, 2010 César du cinéma, for best supporting actress, for Mademoiselle Chambon (2009). nomination, 2014 Trophée francophone, for best actress, for Nesma (2013). "Interview Aure Atika". kunveno.com. Retrieved 24 April 2016. "Aure Atika, la vérité sans mentir". Libération.fr. Retrieved 24 April 2016. "Objectif Cinéma : Michel Fournier - Chef opérateur et cadreur des films de Philippe Garrel dans les années 70 (Interview)". objectif-cinema.com. Retrieved 24 April 2016. "Aure Atika". premiere.fr. Retrieved 24 April 2016. "Aure Atika : "J'aurais voulu être ébéniste"". France info. Retrieved 24 April 2016. Wikimedia Commons has media related to Aure Atika.